Our sash windows London service and products covers the most comprehensive range of any London sash window company available as of the date printed 17th July 2017. Our sash windows London services are high quality and affordable. In order that you might better browse our complete service list, please find the handy links below. Our sash window repair service to London includes sill replacement or repair, sash window rail replacement, stile repairs, glazing, new sash manufactured to fit original frame, sash window overhaul, and resin repairs. We restore, renovate, and refurbish sash windows before costly replacement. In the even your sash window sill is beyond splice repair economically the next best thing is sill replacement – involves the removal of the original rotten section and we will need to splice the pulley stiles as well to install the sill with correct joinery technique. 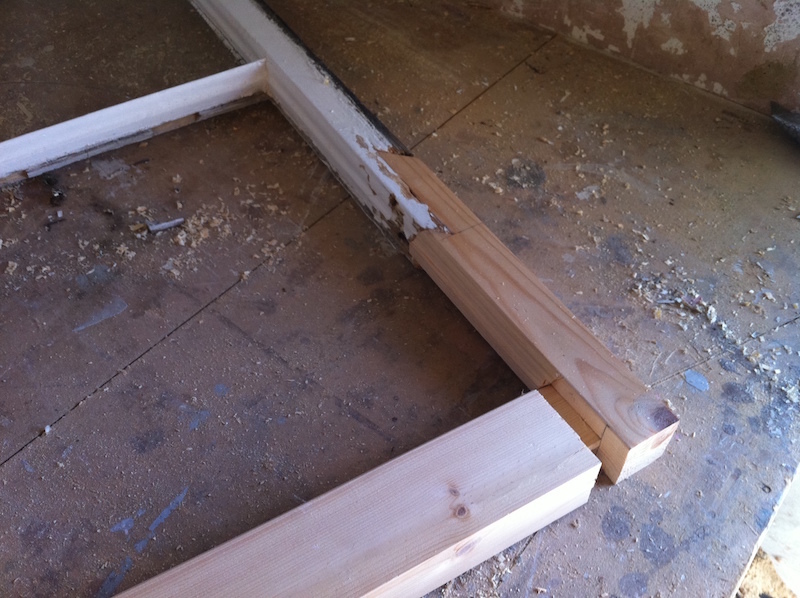 When we remove sill sections we will treat the surrounding area to ensure any wood decaying fungi are removed. We will then dry the area entirely, and prime the sill section so that moisture cannot penetrate from under the sill, as well as above. Below is a typical before and after that you can expect from our sash windows London service team. Sash window sill in need of repair. As we can see from the image this sill is in quite poor condition. The front cheek has rotted away, as well as the pulley stile. The sill is perished all along the front and in the corners. This has occurred as a result of poor quality repair over time and it’s now well beyond patching. In case your wondering, the front cheek is the outer most timber that is next to the external render. You then have the pulley stile where the sashes would sit and slide up and down. The next section of timber is the inner cheek, and then the architrave sits on the inner cheek. Hopefully that helps. Internally the nosing has already been removed and I’ll explain that section of timber in the next image once re-attached correctly. In order that this window be repaired and last, front cheek, pulley stile, and sill section must be removed and replaced. This sash window has had sill replaced, pulley stile, replaced, front cheek replaced, and resin repaired. The new sill and stiles have been primed and undercoated ready for decoration. Internally you can now see the nosing attached. Incidentally some clients ask for a larger, more useable nosing, which would then no longer be called nosing, and would now to a window board. I find this to be a very nice upgrade to a sash window, even a little window board such as 4 inch becomes a very useable space to place things. I often sit by the window and place my cup of tea there. Something I couldn’t do with standard inch and a half nosing. 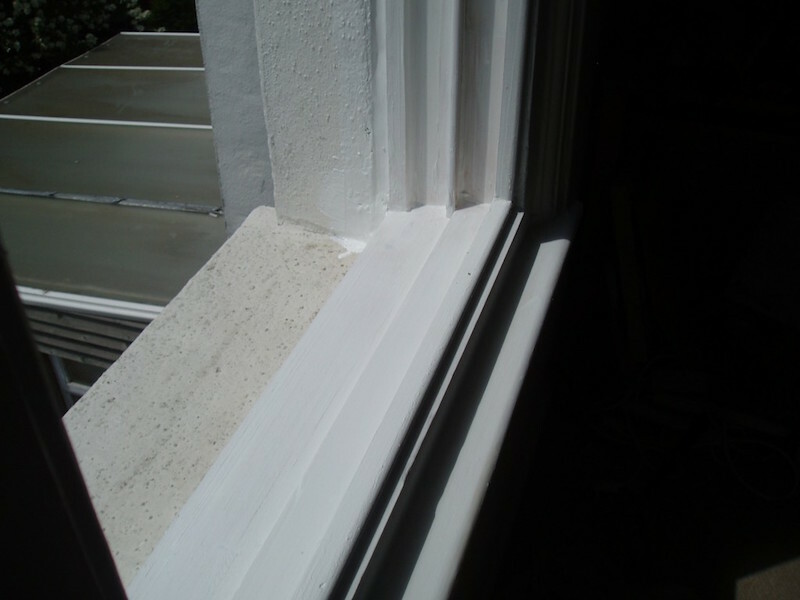 Replacement nosing is also covered in our sash windows London service. When a sash window requires repair and timber splicing, it is almost always the lower rail or sill section. This is because water sits at the lower section most easily and is often well sheltered from the sun for longer periods than the top of the window, which offers mixed blessings. Any part of a window in direct sunlight is always going to be dried out more quickly. This is good but in summer, when at it’s hottest, paint can be damaged more quickly, resulting in flaking which leaves timber exposed to the oncoming elements, especially if exposure to the sun is particularly lengthy. This is why South facing windows take a considerable amount more damage. The sun is the problem, not the rain initially! This means that a sash window lower rail (and sill section) should be decorated and maintained with even more care than the rest of the window. It’s actually worth double undercoating these areas. 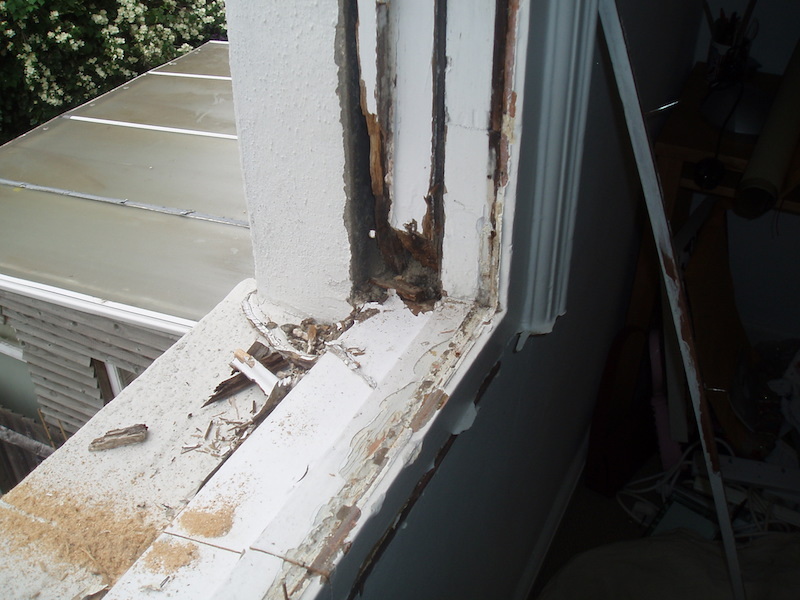 In the event your sash window rail is rotten, you might not need an entire sash replacement. Quite often replacing or splicing the rail, whichever more effective will be sufficient. 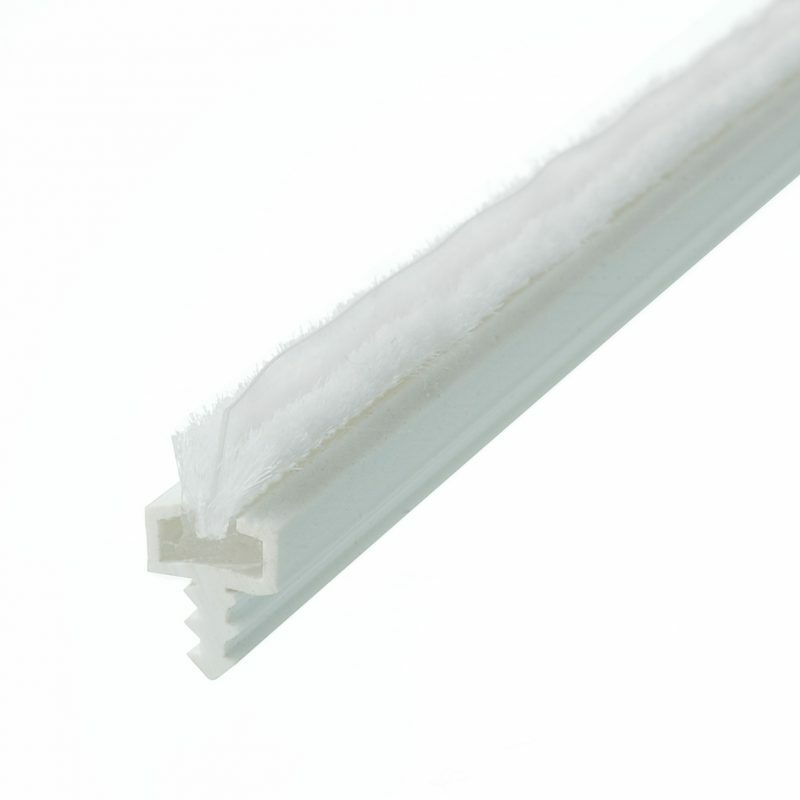 In the event you have a sash with considerable amounts of glazing bar, the cost savings on just one sash alone can be very considerable. The rail replaced below only cost £120, however entire replacement would of been double that. It doesn’t take a great number of windows needing this much repair for savings from our sash windows London service to be in the thousands! Sash window rail spliced and refurbished. 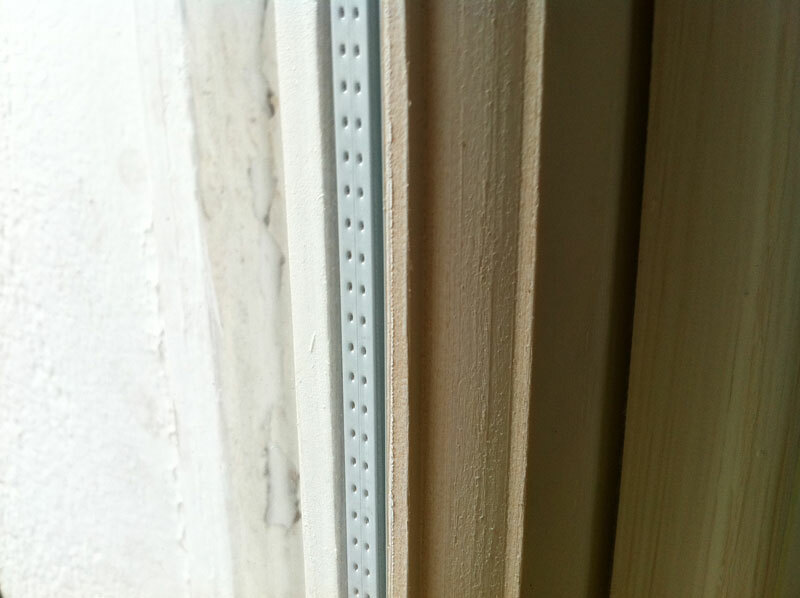 In the sash rail example above you can see the stile also required splicing out. Using correct joining technique we are able to fully structurally secure the sash to new standards. Splicing mortice and tenons as well as the stile in such a manner provides strong surface area to glue and fix sash correctly. If the window is well decorated after repair then there is no reason why this sash window won’t last a lifetime, again! If you’d like to know more about our sash window repair service please follow the link. As part of our sash windows London service we draught proof sash windows. Our draught proofing system is fully guaranteed to reduce draughts, stop rattling, reduce noise, and improve the energy efficiency of your home. With the new EPC rules coming into effect next year, it’s never been a better time to have sash window and casement draught proofing to help the energy ratings. Our draught proofing is invisible once installed, and completely unobtrusive. Staff bead is gently removed and disposed of. Lower sash and old sash cords are removed ready for draught proof machining. The weights are then removed from frame ready for new sash cord and counterbalancing. Parting bead is then removed to allow access to upper sash. Upper sash can then be removed ready for machining. Frames are scraped down in order to remove any loose debris that might affect smooth sash window travel when rebuilt. Whilst free access to the frame, any minor repairs will be carried out as part of the sash window draught proofing service. Old furniture is removed and new sash window security is added in line with the service level selected. We make good any blemishes from old furniture. Draught proofing is inserted into sash. New sash cords are installed and correct counterbalance checked. Parting bead mould with pre-installed draught proofing is now attached. Lower sash is re-hung and meeting rails are checked for good alignment. New staff beading mould attached with pre-installed draught proofing rebated and hidden. New sash window furniture and security is installed and aligned correctly. The service noted assumed that you have not opted for our sash window decoration London service. If decoration is included then the process is slightly different. Please read our information on decoration below. Our key sash windows London service includes the double glazing of existing sash windows. We remove original single glazing and then rebate your sash to correctly fit a double glazed unit. The service relies on your sash windows being structurally sound and of reasonable depth. Normally if your sash is one and a half inches in depth we can work with them. In some circumstances we can install double glazing to smaller depths, on listed building sash windows for example. When sash are extremely slender this technique still allows for the use of original frame. 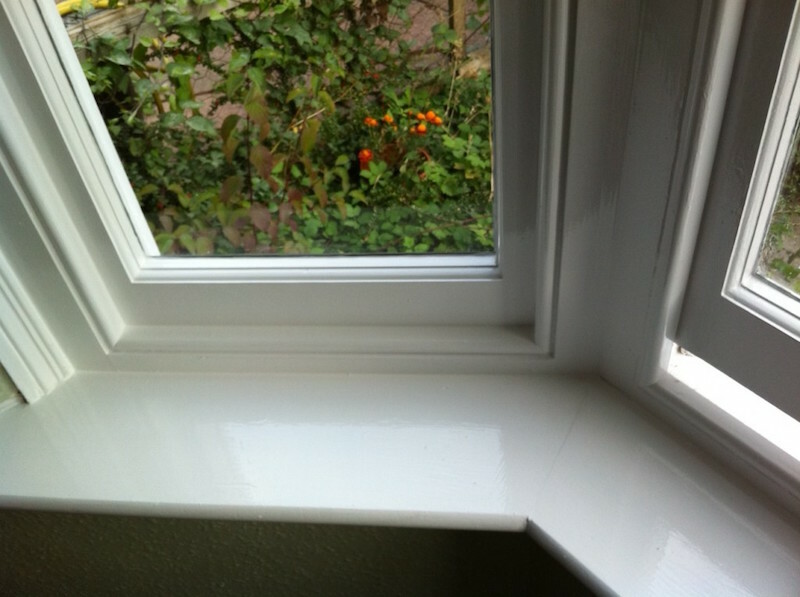 Sash window prepared, primed, undercoated, and finished with a full gloss. The finish above is exceptional and it should be noted that we provide varying levels of service. If you’d like to have your window finished well, but on a budget we can rub down the original frames, fill major blemishes, prime, undercoat, and then gloss. If you’d like to have your windows faced and as higher quality finish as possible, with less consideration on budget, we can also help. If you’d like to know more about our sash windows London service then please do not hesitate to contact us.